The event will consist of normal trials type sections and should appeal to anyone who has previously entered our Production Trials or those new to trials. Most road cars should be suitable. due to the waiver of the need for a competition licence for regional championships. IMPORTANT NOTE: If you intend to enter on the day please contact the Secretary and provide contact details in case wet weather causes any issues with access to the field. Lower Grove Farm, Highridge Road, Dundry, Near Bristol. 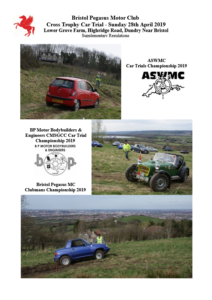 Copyright © 2019 Bristol Pegasus Motor Club. All rights reserved.